Greetings from the music room! 3. Request for the contribution of a skill! As you may know, “specials” see each class twice a six day cycle. So, for music I have two chances to reinforce concepts, teach songs, or repeat fun stories, dances, or games. When everyone is seated, students will likely learn a school-wide song. These songs are sung during assembly on the following Day 1 and are designed to give students a sense that they are part of something larger– the Symonds community. As they sing in a group of 330+ instead of the usual 15-20 the lyrics and message of the song itself is reinforced. All of the activities emphasize participation among everyone and include concepts that allow students to internalize music and movement. When appropriate, I strive to be cross disciplinary and discuss history, science, math, and language as it relates to music and the arts. My goal is to end class with a musical piece for silent listening. Given our 30-35 minute block together I admit that my goals are often loftier than time will allow. Throughout the class, our self created Responsive Classroom goals are encompassed under “Be Safe, Kind, and Respectful”. We talk to each other, sit down, sing, dance, play instruments and ultimately line up to exit with these concepts in mind. Grades 1-5 have been beginning work on Ukeleles. I have a new guitar pick maker(! )–each student will be given their own pick, made from used gift cards for use in class. Our focus in the upper grades include 3 chords– C, F, and G. In the lower grade we are working on how to hold the instrument, locate notes, and pick each string. This month we are comparing the music of Bach, Mozart, and Beethoven. I have given everyone a description of the Baroque, Classical, and early Romantic period of music and played examples. Students are then asked to identify each composer by the sound of a piece. Also, look for a kids show with me and Jay Mankita at the colonial theatre in early April. I do lots of “adult” music but you’ll have to do your research to find out about that! Easing in nicely these first few weeks of school. The class configurations (roughly 20 to a class) are pretty workable. Having a para or a tutor in each class make teaching music easy for a couple of reasons. For one, I don’t have to stop an activity if there is a behavioral issue to attend to. The mere presence of another adult in the room creates an easier dynamic with which to work. A more self-(or class)-serving use of another adult in the room is simply the use of a partner in a couples dance if there is an uneven number of kids in the class. I have the administration and my principal to thank for creating and allowing for this dynamic. I always start the year reviewing ear training solfege concepts from the previous year. I also dance A LOT to reinforce concepts of working together, sharing space, and moving to a beat. I use lots of material from Andy Davis, Mary Cay Brass, and the Amidons’ books The New England Dancing Masters. They are old friends and colleagues from around my hometown, Brattleboro, VT. The Dancing Masters have simple couples dances from my area and around the world. I usually accompany my class on mandolin or guitar but the recordings that go with the material are great as well. So far, my students are a happy lot, taking it all in. 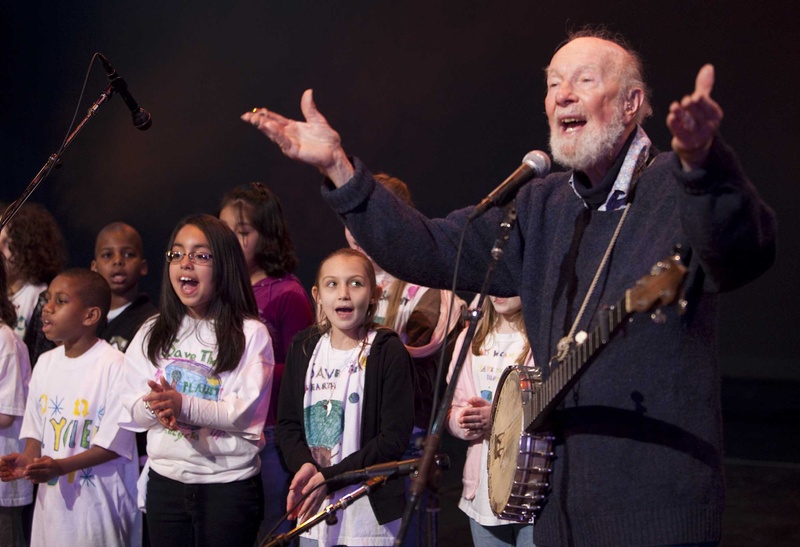 My 3rd, 4th, and 5th graders loved the stories I shared about my time at Pete Seeger’s house last week but in order for them to fully appreciate who he is, I needed to spend a few minutes on Youtube exposing them to various aspects of his life. My kindergarteners are easing in and starting to understand how to enter the classroom sit still, and be silly at the appropriate times! 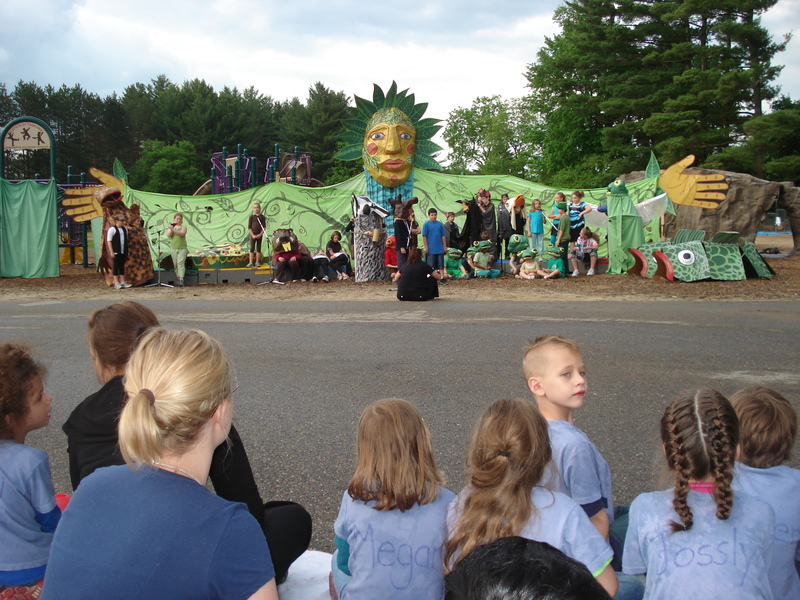 I started at Symonds school 5 years ago, having taught for about 8 years prior in various small elementary schools throughout Vermont and New Hampshire, and in a preschool Montessori center in Albany, New York. I also worked as a math and science teacher in a school for at risk youth 4-12th grade in Holyoke, MA. Keene is in many ways the opposite of Holyoke, MA. While Holyoke is a post industrial urban New England town with a large lower income Latino and African- American community, Keene might be characterized as a picturesque. mid sized, white, rural, politically middle of the road middle income community. Not that Keene doesn’t have problems that everywhere America has– it does! …Poverty, drugs, empty store fronts, etc. but Keene has a kind of Rockwellian optimism (and looks the part too) that for the most part doesn’t exist in the America that I have experienced. A measured democratic culture with an educated and civically active white and blue collar population. Keene has a college (Keene State) AND industry. Despite the fact that Keene has been placed in New Hampshire, the taxpayers mostly believe in paying for public education. That said, the “no raising state taxes” pledge that politicians in NH must take to get elected has placed a tax burden on local communities that is proportionally greater than her sister states Massachusetts and Vermont. Symonds has an active PTA and a principal that believe in a liberal arts education. In other words, an all inclusive education that encompasses physical activity and visual and performing arts into the academic curriculum. This is intertwined with the aforementioned social curriculum, Responsive Classroom. This all comes together to create a school with a positive working environment. In other words, I have a great job! The other factor that makes my everyday wonderful is a highly collaborative staff. The PE teacher (Beth), the art teacher (John) and I form what is called the Quest team. 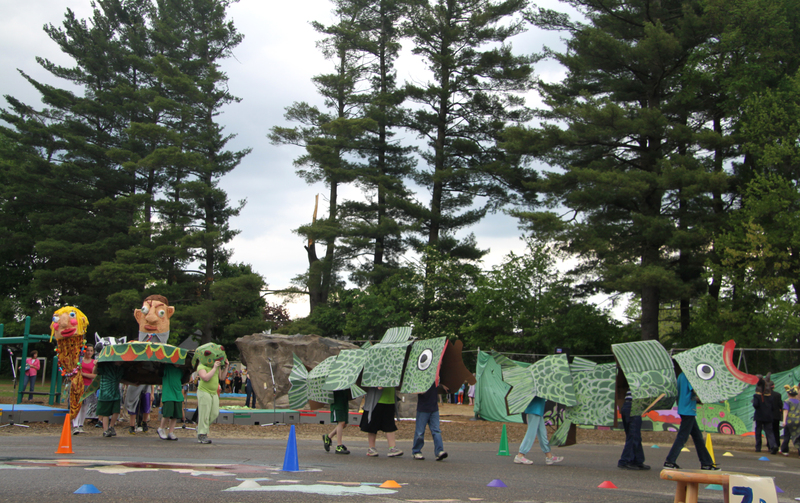 Sounds like a superhero squad or sorts but we are a team set up to use “Quest” money– This money is put aside by the district and used by each of the five Keene elementary schools differently. Some schools use it for gifted and talented programs. Our school collectively believes in the enrichment of all students, thus the money is used by our superhero squad to create programs that support arts and academic activities throughout the building. This means that I can do crazy things like write a play for the entire school, hire a choreographer, call up folks from Bread and Puppet (a legendary puppetry troupe) to build enormous puppets and end up with an outdoor production involving 330 students, 40 staff, and watched by over 700 family and community members. This is true. The pictures on this site are a testament to that. Last year I got a grant from the Putnam Foundation to do a cool project. My next post will be a description of that…. So the other night I went Pete Seeger’s house to conduct a taped interview for a coffeehouse show I’m producing in N.Y. on the songs of Woody Guthrie. After school, I drove the three hours with my friend and cameraman Bucky from Brattleboro, VT to Beacon NY. Having grown up around Pete and the sloop Clearwater, and having many mutual friends, I had been to his house several times before, but never had I had the opportunity to just sit down, talk and play songs for a few hours. I have had various interactions with him over the years, did concerts with him and recorded on his last CD with the Rivertown Kids, “Tomorrow’s Children”. Regardless, spending an evening alone with your (and many other people’s) hero is pretty cool. His house is perched on top of a small mountain overlooking Newburgh Bay on the wide and powerful Hudson River. True to his usual modus operandi, the first thing he said was, “My memory isn’t what it used to be…”. Thus, we couldn’t spend much time reminiscing about the many friends we had in common through our common activities over the years. He is 93 years old– despite that he spent the evening telling stories like he always had. Before we did the interview I mentioned that I had left some cookies in the car (my mother informed me of his sweet tooth). He said “Well, you know I’m a cookie-haulic”. (An hour later I took a look at the package and the 6 choco chunk full sized cookies were gone!). After talking about Woody as I had planned, I asked him some questions on behalf of the kids at Symonds School, the main one being how young people can make peace in the world. He launched into a story about how he has it made a habit to walk into classrooms and greet kids with “Howdy, cousins”. The Kids, he said would look at him like he was crazy but he would go on to tell them that we were once foragers and as the result of “progress”, our population would double every certain number of years. He then would go back to say that during the time of foraging, the few thousand people on the planet were all distantly related cousins and now, especially to children, that concept is simply inconceivable. However, we ARE all still cousins. Children need to remember that despite the color of your skin, language, etc, we are all related. Compassion, understanding, unity, and the power to not refer to another human as “evil” is important in your family and in the greater human family. Just like I say to my kids, “there’s no such thing as a bad kid, just bad choices”. Of course I gave him a Symonds “Peace Place” cd and told him all about my school, the cd project from the year earlier and our social curriculum. After shuffling to the drawer, grabbing a new packaged flashlight, fiddling with the batteries and getting his glasses, he looked at the cd and said “That Mr Cate must be a great principal” then went on to say that the only thing that’ll save the world is creativity and the arts. 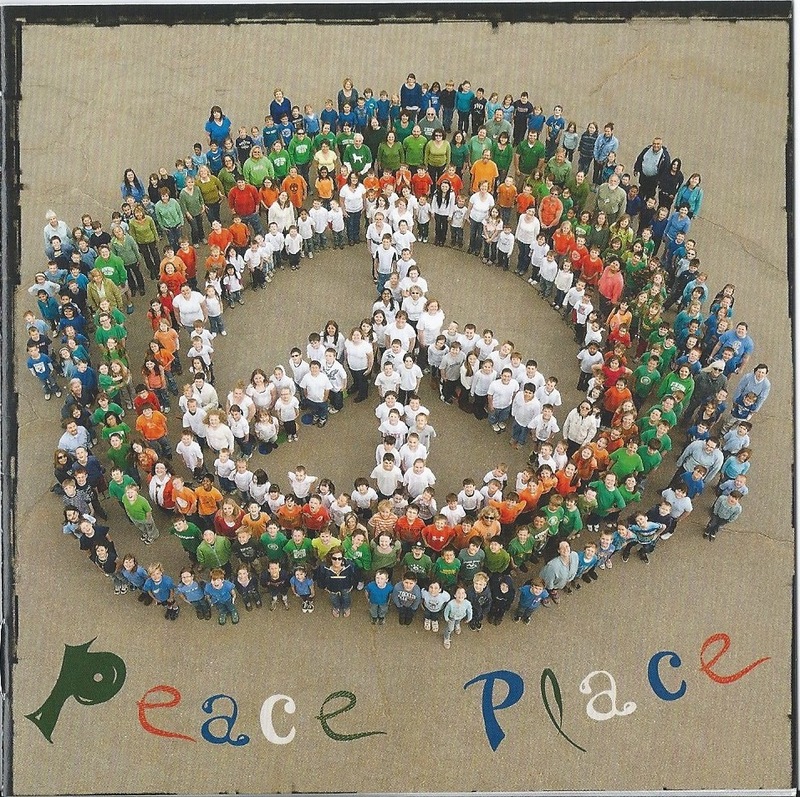 When he took a closer look at the cover of the cd (an aerial photo of 400ish kids and staff standing in the shape of a peace sign) he got up and declared, “gotta get something for you”. He ran up to his loft, climbing a vertical ladder with books piled everywhere (he’s 93!) and came down with 200 bumper stickers that read “Coexist”– you may have seen it– it’s lettering made up of various spiritual symbols together including the peace sign. Having seen the cd cover he ALSO had to tell me the story of the peace sign and how it was born from the letters N and D of “Nuclear Disarmament”. Of course the night wouldn’t be complete without a few songs so when he saw that I had my mandolin with me, he suggested we should play. I was itching to sing a yodeling song I learned from him years ag0– the Sons of the Pioneers’ “Way Out There”. What fun. So, I am now left to happily give all my 3rd , 4th and 5th graders each a “coexist” bumper sticker presented by Pete Seeger on the eve of the international day of peace. I am willingly obliged to carry on a message of peace to the children of Symonds School. How lucky I am. This is the first of many posts on the role that the arts WILL play in re-forming our view of education.